That was the response when I told some range buddies that I was set to write-up the Glock 19. Yes, the Glock 19 launched years ago and no, it hasn’t seen any major modifications since the Gen. 4’s release. So why do a review now? Well, ladies, this one is for you. 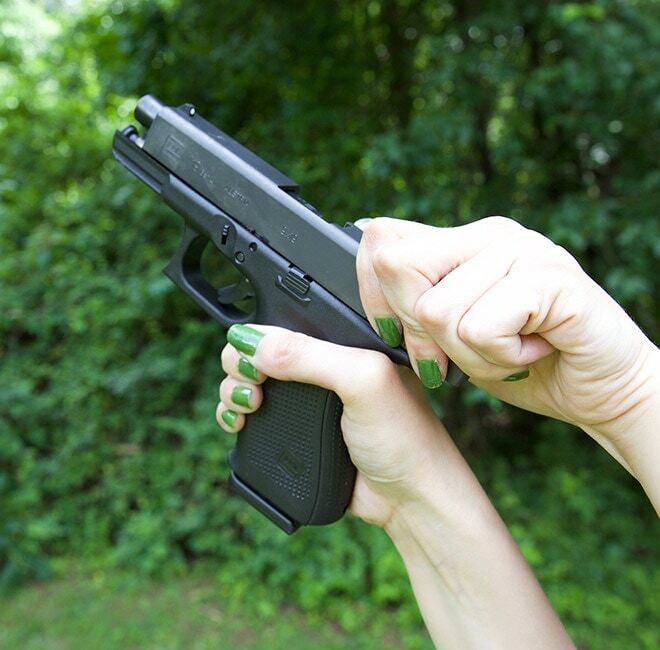 After fielding inquiries on the Glock 19 and whether it would make a good “girl” gun, I decided to put metaphorical ink to paper and give the Glock 19 its official Guns.com review – lady style. 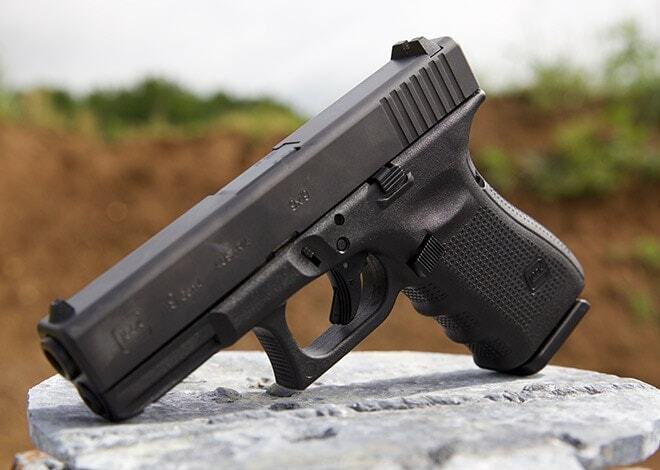 The G19 follows Glock’s basic polymer semi-automatic, striker-fired pistol format. Featuring a double stack magazine with 15 round capacity, the handgun measures a total of 7.28 inches with a barrel resting at 4.01 inches. 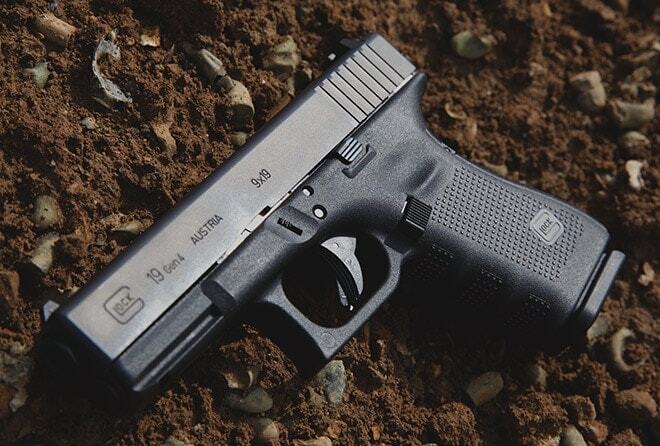 Standing just under five inches tall with a width of 1.18-inches, the G19 falls in that nice middle area. Not too big nor too small, the G19 is like the Goldilocks of the gun world – it’s just right. The steel slide rests atop the polymer frame, offering a lightweight design. Loaded she tips scales at just over 30 ounces, which proves quite manageable on the range or nestled in a holster. Though kitting out the Glock is one of the industry’s favorite pastimes, I decided to shoot the G19 as it came from the factory, with no aftermarket accessories. As I mentioned in the G43 review, the stock sights leave a lot to be desired and the G19’s are no different. The standard white dot setup is underwhelming. 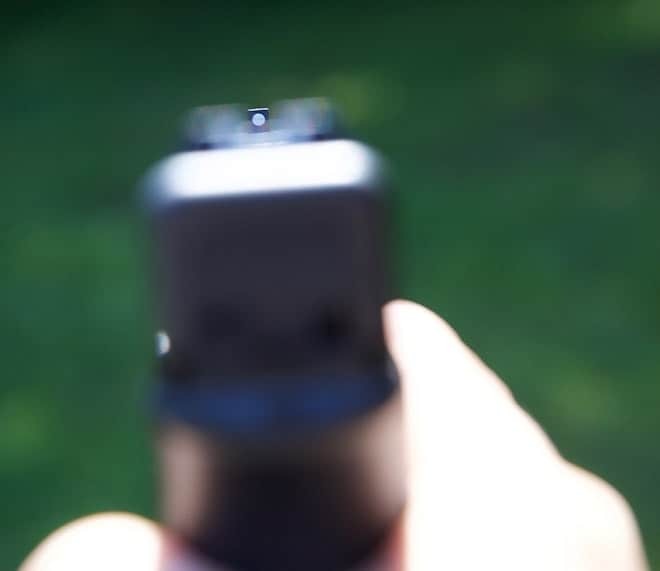 Under normal range conditions, they will do just fine but if carrying is your goal, it’d be prudent to swap out the factory sights for a pair that really pop against the target. With aftermarket sights a plenty, there’s a bevy of options to choose from. The G19 ships with two sets of backstraps — medium and large — to accommodate larger hands. Those with smaller paws, like myself, will find the grip manageable, but not always convenient. I would prefer a design similar to Smith & Wesson’s M.20 which boasts more backstrap variety for smaller handed shooters to really customize their grip. Though I didn’t experience any deviation in shots due to the gun being too big, I did struggle with one handed manipulations, specifically when it came to mag dumps. The mag release was set just a tad too forward for my thumb and I struggled at times to fully depress it. Not necessarily a deal breaker, it proved mildly frustrating. 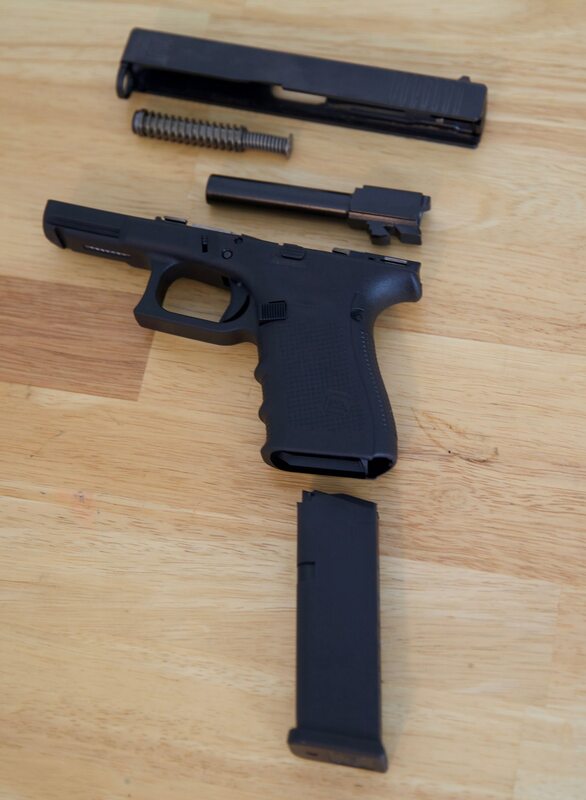 One area where the Glock excels is the slide release. Very responsive, it took little effort to depress, allowing me to fluidly chamber a round. Additionally, the slide glides effortless on the range. Those who prefer slinging the slide back to chamber a round will find no resistance in doing so with the G19. 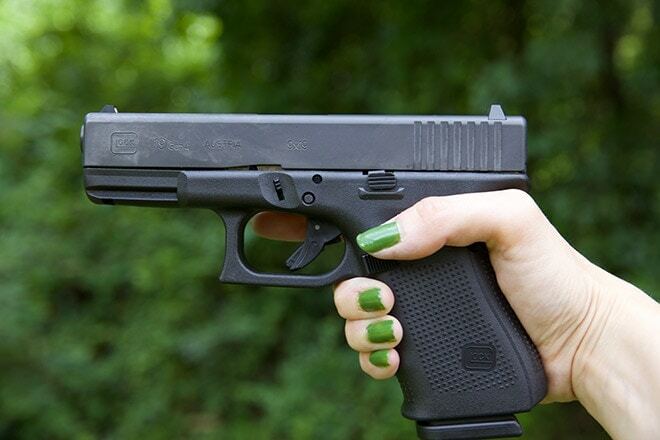 The Glock is the quintessential “plastic gun,” just, don’t write her off as a toy. 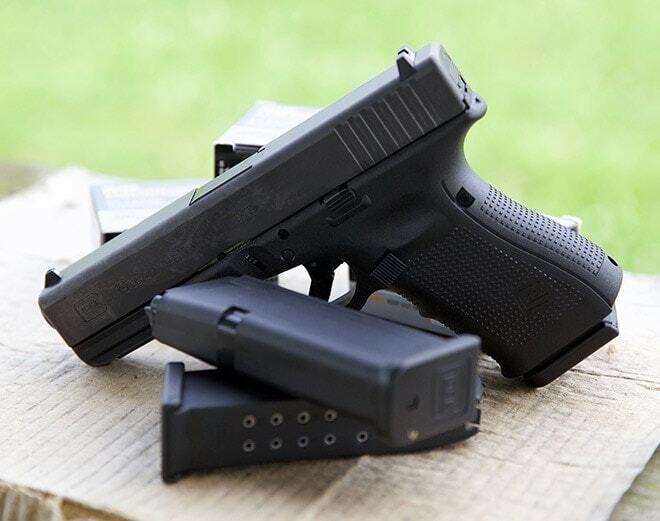 Slinging 9mm rounds down range at a frenetic pace, the Glock can keep up with whatever stride you set. I spent several days on the range with the G19, shooting for hours at a time. Despite my puny arm muscles, I was able to manage the G19 just fine. I didn’t feel fatigued holding or aiming and I credit the gun’s “plastic” design for alleviating the weight. Decked out with a semi-aggressive grip texture, I was pleased that the surface didn’t tear up my hands during shooting. Some manufacturers take the non-slip surface too seriously and the result leaves hands raw and sore – not a good angle if you’re looking to attract women to your offerings. 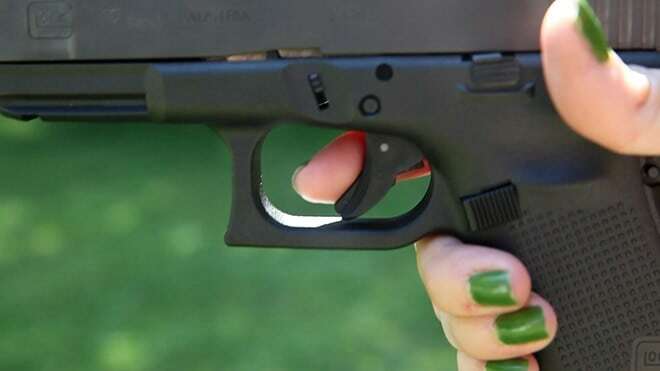 Glock has found a balance though between offering enough beveling to permit a solid grip while also keeping all the skin on shooters’ hands where it belongs. The G19 shot like a Glock should. It reliably ate all sorts of ammunition from standard white box Winchester to the high-end Sig V-Crown all the way down to the nitty gritty, reloads. Without a doubt, one of the most reliable handguns on the market it’s not a stretch of the imagination to see why this pistol enjoys overwhelming popularity among the concealed carry and shooting crowd. Despite the lackluster aforementioned sights, they performed adequately and accurately during my daytime shoots at the range. 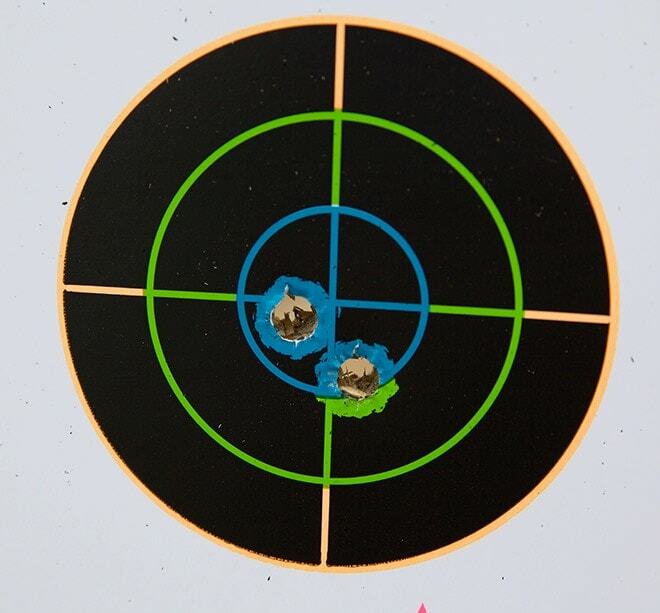 I was hitting my mark at 7, 10, 15 yards and 20 yards. 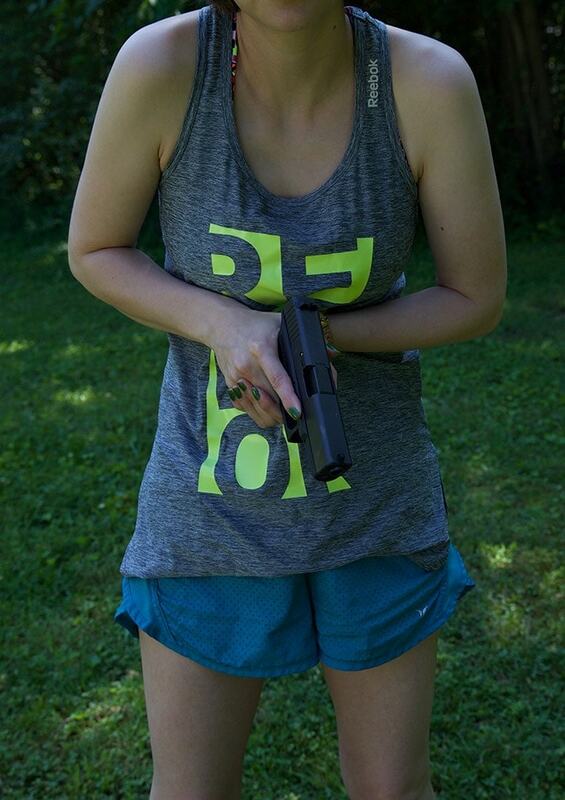 I didn’t take the Glock for an evening stroll on the range but had I ventured into the dark with her, I would have certainly utilized the small accessory rail to slip a compact light onto the frame for added assistance in low-light or no-light shooting. While we’re on the subject of disappointing attributes, there’s that trigger issue. Ah, it’s the bane of all Glock owners and the reason many resort to aftermarket trigger kits. It’s just not fun to shoot. Gritty and sluggish, this is certainly one area Glock could upgrade or improve. The 19 looks intimidating. It’s blocky, all-black design certainly doesn’t set fashionable hearts a flutter. 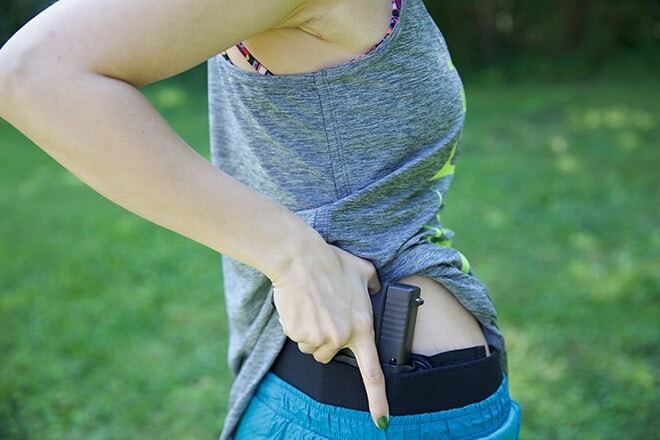 This may be the very reason some women are so reluctant to try their hand at the compact Glock design. Simply put, it doesn’t look like it would work well for women, especially petite ladies. The G19 is surprisingly versatile, though, and therein lies its strength. Shooters can really dial in what they want from it, swapping out sights, triggers, adding a little Cerakote or grip enhancements. Pair that with the host of holster options available for the model and women will find that there’s plenty of ways make the Glock their own. One of my preferred methods of carry while on the go was the Crossbreed Modular Belly Band. 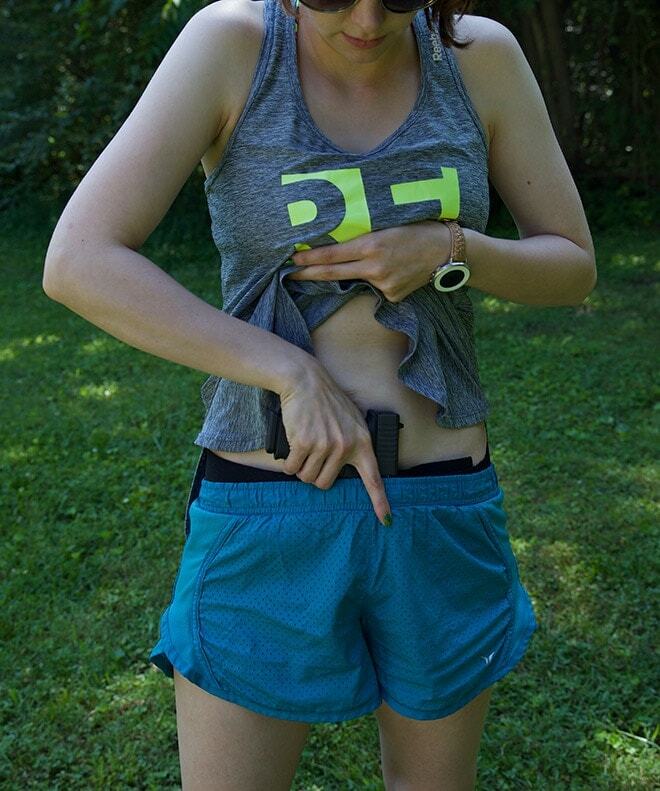 Having just resumed running as a means of staying in shape, I turned to the Crossbreed/Glock combination to keep me safe on early morning jogs. Despite sporting running shorts and thin tank tops, I was able to successfully and securely conceal the G19 inside the Crossbreed holster. My running buddy had no idea I was packing 15 rounds of 9mm while we ran up and down the hills of my Tennessee neighborhood. 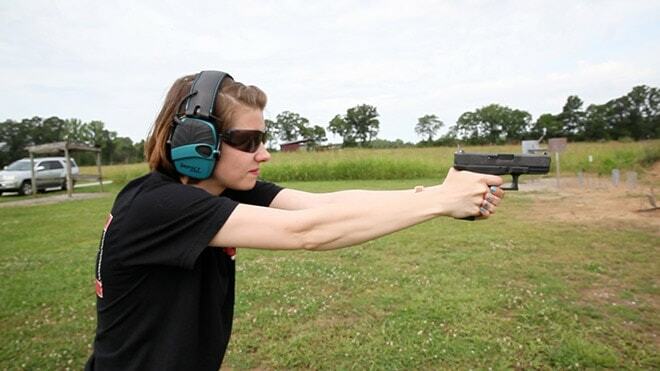 Where the Glock really shines as a superb pick for female shooters, and those new to the game, is its ease of use. Point. Shoot. Repeat. It’s not picky on ammo, malfunctions are rare and it’s easy to maintain. 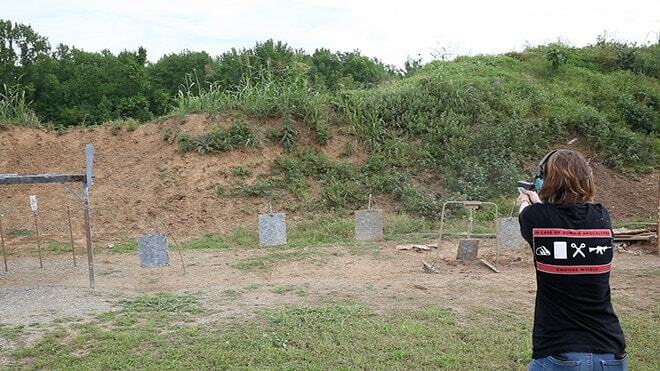 During the course of this review, I tossed the Glock onto wet grass, dirt and mud. It still pewed-pewed every time. As I sat down to clean her, I noted the slide had mud caked into it. I had no idea she was so dirty because she just keep plugging along. This isn’t a gun that you have to worry about cleaning in between range visits. It’s as low maintenance as it gets. Which is advantageous given the fact that takedown requires that infamous trigger pull. The takedown itself isn’t hard to accomplish. It requires the removal of the magazine followed by a rigorous inspection of the chamber to ensure no bullets linger. Trust me, you want to visually inspect and manually inspect that area. We don’t want any unexpected bangs. Once the gun is cleared (seriously check in several times), point the 19 in a safe direction and pull that trigger. If you did it right, you’ll hear a familiar click. If you didn’t, well you’ve earned a nice hole in your carpet. After the trigger is depressed, wrap a hand around the top of the slide and apply rearward pressure to push the slide to the rear. Simultaneously, pull down on the releases fixed on both sides of the gun. The slide should rock forward, sliding off the rails. From there, remove your spring and barrel and get to cleaning. To reassemble, simply put everything back into place in the slide and slip it back onto the rails. Rack it and you’re ready. Ladies, you can’t go wrong with the G19. Though it suffers some areas of improvement, overwhelmingly the Glock 19 is a solidly built pistol that offers enough modularity to keep things interesting. With the ability to add aftermarket accessories and a bevy of holster options to choose, the G19 earns high marks and proves why it remains one of the most sought after carry guns on the market.